As I hinted at in my previous post, the history of Chinese Chess (Xiangqi 象棋) does not go back nearly as far as that of Go or even Backgammon. There is no convincing evidence that any form of chess was played in China before the Tang dynasty (618-907), and even during the Tang dynasty there is only very limited documentary evidence for the game, and no certain archeological evidence, so it does not seem to have been widely played before the Song dynasty (960-1279). However, by the end of the Northern Song (960-1127) Chinese Chess had become extremely popular, and not only is there unambiguous documentary evidence for the game, but large numbers of Chinese Chess pieces in a variety of materials (pottery, porcelain, wood and bronze), dating from both the Northern Song (960-1127) and the Southern Song (1127-1279), as well as the Yuan dynasty (1271-1368), have been found, including several complete sets of bronze Chinese Chess pieces. The complete set of thirty-two bronze Chinese Chess pieces shown below were found in Inner Mongolia, and date to the Northern Song period. 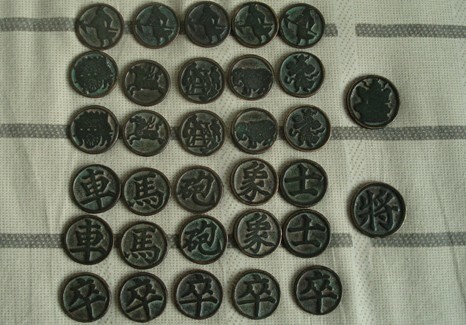 Each piece is about 2.5 cm in diameter (although the Generals are a little bigger), and has a Chinese character on one side and a picture on the other, which is typical of Song dynasty bronze Chinese Chess pieces. 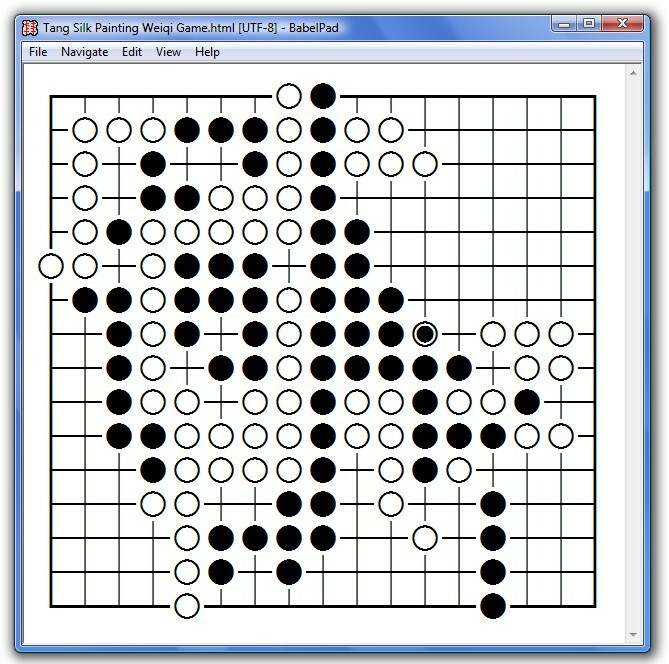 What is less typical is the fact that the Chinese characters are the same for both players (the general which is face down in the picture above is also a jiàng 將), which may indicate that differentiated characters for black and red were a later development. The other interesting fact about this set is that it was found in Inner Mongolia, on or beyond the borders of the Song empire. 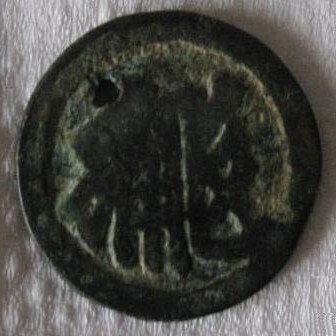 In fact, quite a few examples of Chinese chess pieces have been found in peripheral parts of China, such as this beautiful example of a Catapult (pào 砲) piece that was found in the ruins of the Silk Road oasis city of Gaochang 高昌 by Albert von Le Coq (1860-1930) during his expedition of 1904-1905. 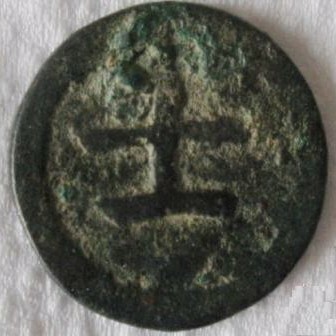 Therefore we can assume that the Tangut character shown on this chess piece is an abbreviation for one of these compound words, meaning either "general" or "lieutenant general". This seems somewhat distant from the possible range of meanings of the Chinese word shì 士, but does immediately make me think of Japanese Chess (shōgi 将棋) where the place of the shì 士 of Chinese Chess is taken by a Gold General (kinshō 金将). 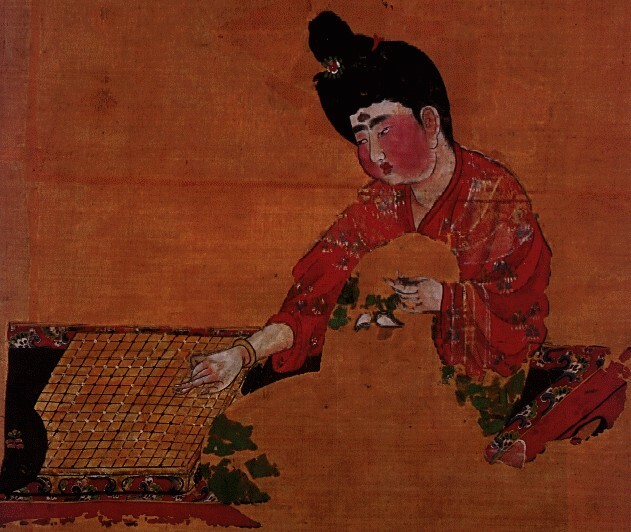 Is it just possible that the Tangut version of Chess was perhaps intermediate between Chinese Chess and Japanese Chess ? This must surely be the one and only record ever of a game of Go (Weiqi 圍棋) played on a 9 x 12 grid. What is fascinating about the picture is that the pieces have not been randomly dotted about the board by the artist, but do seem to represent a real game at one particular moment in time. With 38 black stones visible but only 20 red stones, it is clear that the red player (on the left) is not doing so well. 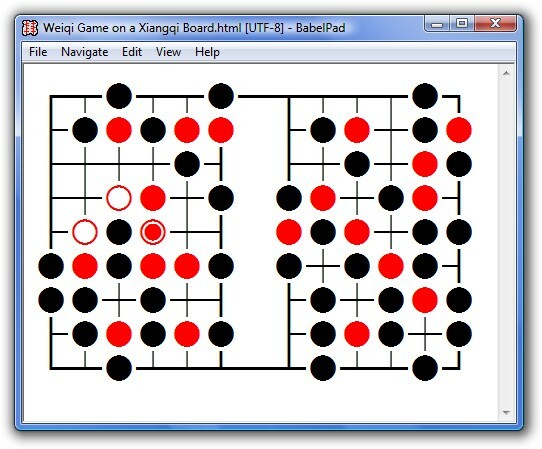 It looks to me as if black has just played the ko in the middle of the right side of the board, and red is playing a ko threat, in which case I can only assume that his hand is obscuring two red stones (marked as hollow red circles in the diagram above), so that the stone he is putting down (marked as a red fish-eye in the diagram) threatens the entire bottom left corner. There are perhaps several other points of interest in this game from a Go perspective, not least the use of black and red stones rather than the traditional black and white stones, but from the perspective of Chinese Chess the main interest is obviously the board. Given that the artist seems to have faithfully represented the exact layout of a game of Go in progress, we can hardly assume that the two extra gridlines are artistic error, and so it would seem that the board must have been as it is drawn. As the dividing river across the centre of the board is a feature exclusive to Chinese Chess, I think that the most likely explanation is that this board was intended for playing a lost variant form of Chinese Chess (when not being borrowed by some pretty desperate Go-players) which would have had a greater number of pieces than standard Chinese Chess (something more closely related to Japanese Shōgi 将棋 perhaps). The other interesting feature is the simple fact that substantial wooden Chinese Chess boards were in use, and that the game was not just played on ephemeral paper boards as it normally is nowadays. 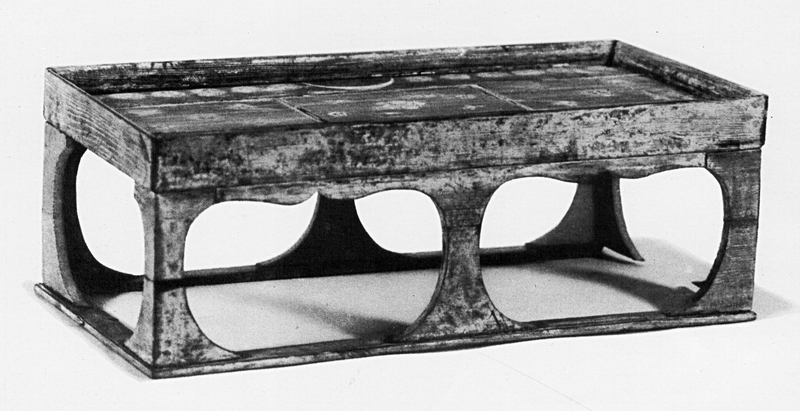 So perhaps one day an actual example of one of these unusual Chinese Chess boards will be unearthed. For comparison with the above game diagram, here is my best attempt at a game diagram for the game of Go depicted in the famous Tang dynasty (618-907) silk painting that was excavated from Tomb #187 at Astana in Xinjiang (in the nearby Tomb #206 both a 19 x 19 Go board and a Backgammon board were recovered). The stones are not very clearly marked in all cases, so it is only an approximation of what the artist actually painted, but nevertheless it is obviously not an acurate representation of a real game. Note also that the board has been painted as a 16 x 17 grid, which is almost certainly an error for a 17 x 17 grid. 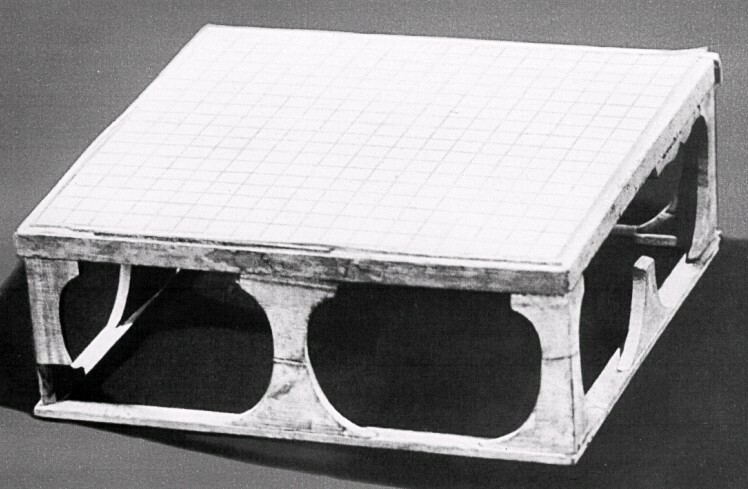 I have also found a game diagram for a 13 x 13 grid Go board (40 x 40 cm in size, with a 30 x 30 cm playing area) that was discovered in 1977 in a Liao dynasty (907-1125) tomb from Aohan in Inner Mongolia (敖漢旗白塔子遼墓). When the tomb was excavated it was found that although the board had partially decomposed, 79 black stones and 76 white stones (155 in total, 14 short of the expected 169 stones for a 13 x 13 board) were still laid out on it. I have retranscribed the game diagram below (the 14 spaces in the bottom right corner are where the 14 missing stones should have been, and the other spaces are where some of the stones have been misplaced from their original positions on the board). 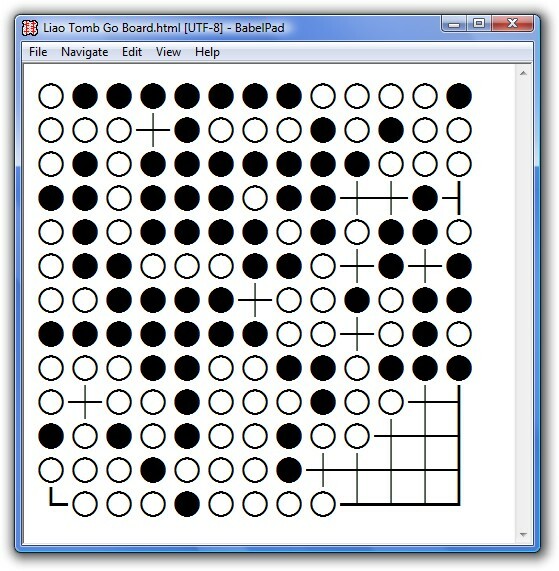 In this case the stones do not represent a game position, but appear to have just been laid out on the board for display. 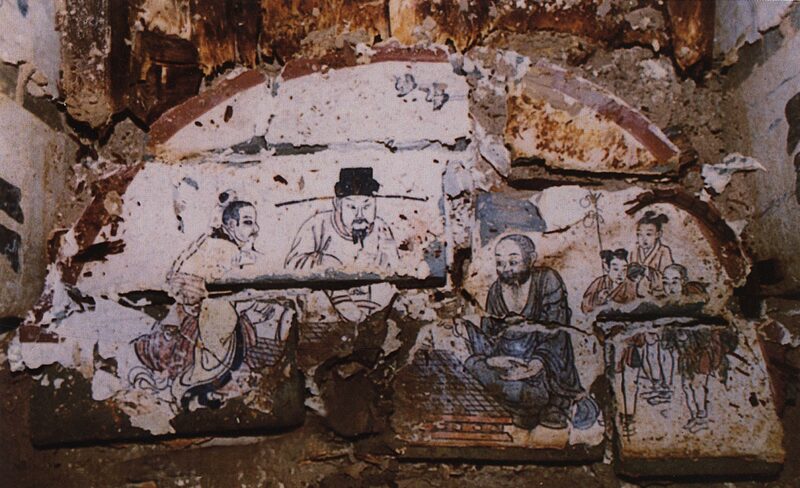 I don't have a picture of this Go board, but I do have a good picture of a game of Go on a mural from a different Liao dynasty tomb (at least I think it is a different tomb ... somewhere along the line I lost the source and description for this picture). 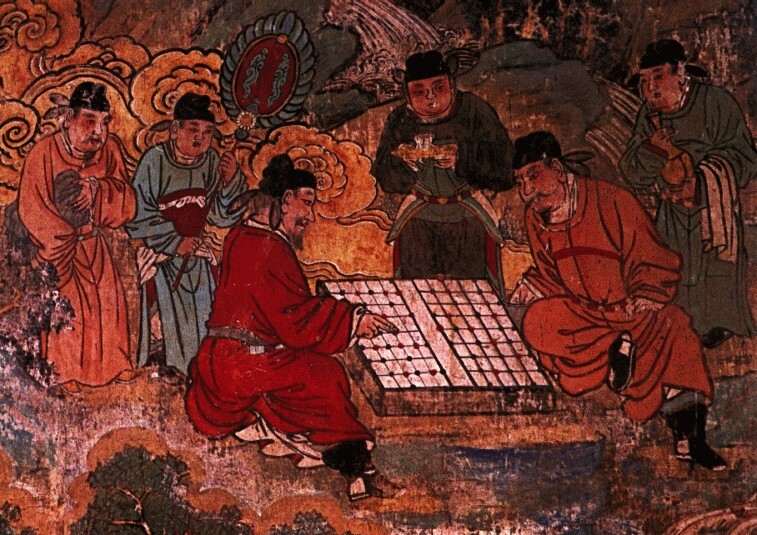 It appears to show a Han Chinese player on the left and a Khitan nationality player on the right, with someone wearing an official's hat watching or adjudicating. It is difficult to be sure, but by my reckoning this is also a 13 x 13 board, which makes you wonder, did anyone in the peripheral areas of China play on a standard 19 x 19 board ?